Some Colt Model Ms (1903 .32 ACP & 1908 .380 ACP pistols) came in factory presentation cases. These cases were available with both blue and maroon linings and were offered by Colt's for a small extra expense. In 1929, the retail cost of this case was $1.90. The cases along with special finishes and grip types offered for this model contributed to its success among firearms available in the retail market. 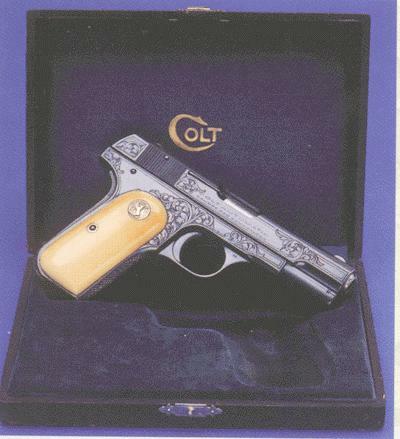 Colt 1908 Pocket Hammerless .380 (Model M) - factory nickel plated finish with flush medallion checkered walnut grips in blue lined factory presentation case. 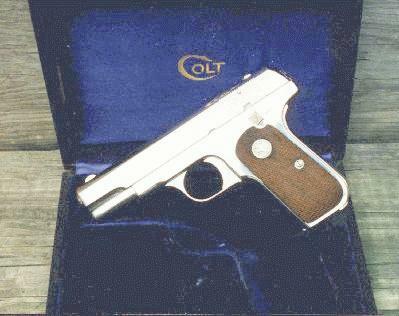 Colt 1903 Pocket Hammerless .32 ACP (Model M) - in a maroon lined factory presentation case. These cases were an option that was available for both standard and embellished Model M pistols. The correct mother of pearl grips on a gun of this vintage (ca. 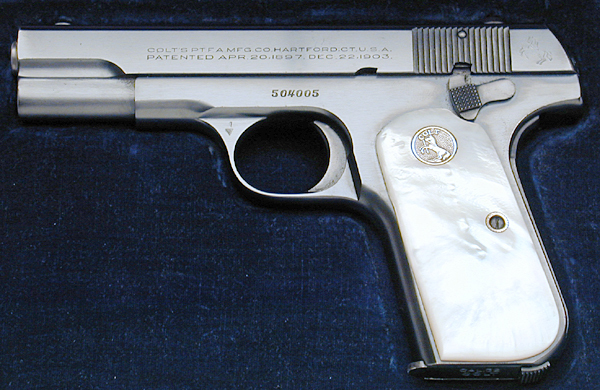 1921) should have the flush Colt medallions in each grip. The grips on this gun appear to be a non-factory aftermarket accessory. 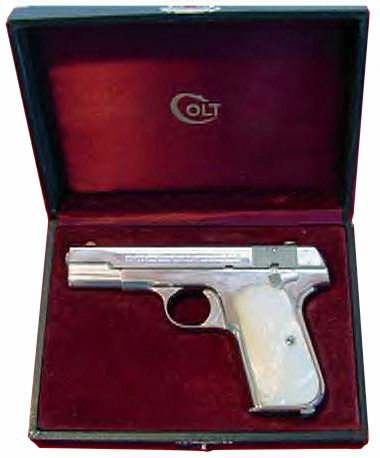 Colt 1908 Pocket Hammerless .380 ACP (Model M), factory engraved with flush medallion ivory grips in a blue lined factory presentation case.